Mark it off as "Gondola Greg is losin' it" if you like, but I thought a change of pace might be fun. 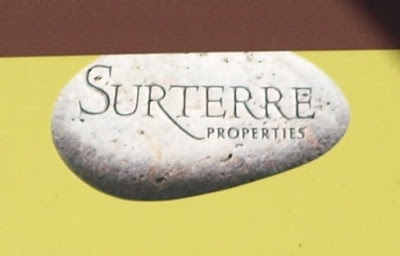 No, I'm not running out of blog ideas, I just couldn't pass up the opportunity to give this piece of commercial graphic design the once-over. 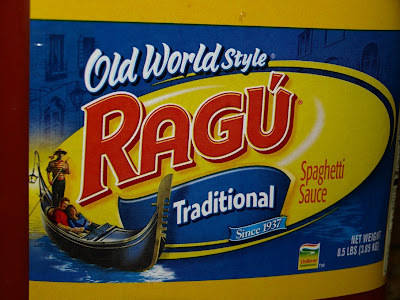 Ragú "Old World Style" spaghetti sauce! My family is very Italian, and my wife and her mother routinely cook up amazing things in the kitchen - often with the help of our two daughters. 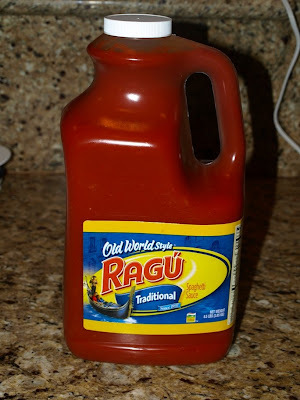 But the other day, (as a result of some great coupon deal, I'm sure) this giant jug of Ragú ended up on the kitchen counter, and I found myself critiquing it - not the sauce, the gondola! 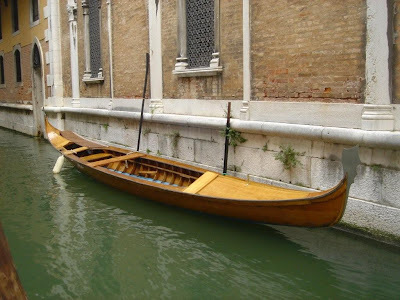 We're looking at a pretty decent artist's rendering of a gondola. It does contain some of the classic "American revisions" that occur in both drawn and built versions. 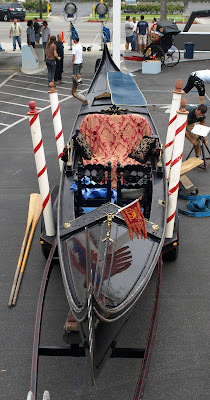 For starters, the gondola has been shortened in two key areas: the passenger space, and the deck between the seat and the gondolier. 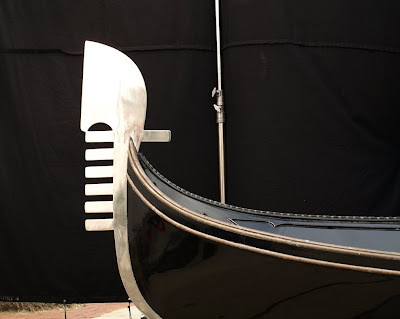 This shortened caricature of Venice's most notable boat is so commonplace that I think the folks at Ragú decided that a "true rendering would have looked "wrong". Not surprisingly, the artist decided against an authentic gondolier's deck, opting for a symmetric stern more reminiscent of the boats at The Venetian Casino. The couple is sitting in a seat that's hard to get a good look at. It could be authentic, but it could also be modeled after the ones at The Venetian Casino too. I'm not sure where I stand on the lamp. It's definitely "old world", and I've seen similar lamps at some gondola operations in the US, but I suspect that Ragú stumbled upon it by accident. The ferro, while it is presented in a brass or gold-tone, does have six teeth, with one aft. 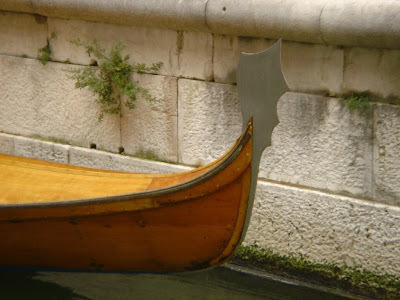 The most authentic areas of the Ragú gondola appear to be the foredeck and the rails. I was quite impressed with how they captured the brass rubrails and plates on the trasto da prua. The artist also managed to capture the carvings on the trasto and the trim on the deck. Upon closer inspection, I discovered that the bow is almost twice as wide as it should be, while the stern seems to be proportioned in the opposite manner. 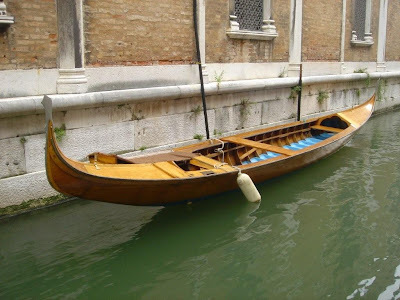 Now, let's take a look at the gondolier. Nothing about his uniform is totally wrong, although most gondoliers choose not to wear red stripes with a red sash and scarf. Contrast is often preferred. 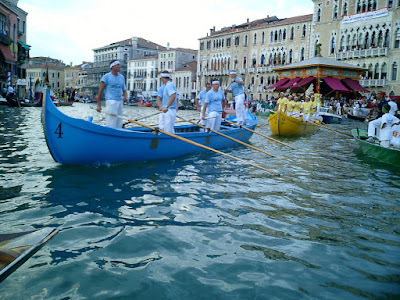 The sash and scarves are usually only worn in Venice with a marinera (overshirt in black or white), and usually only on special occasions. 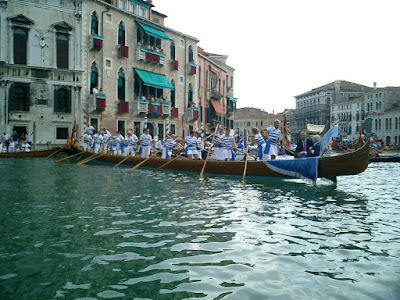 In the US it's common to see gondoliers wear them with only a striped shirt. As for the question of red stripes vs. navy stripes - navy is the standard, but red is accepted in most circles. 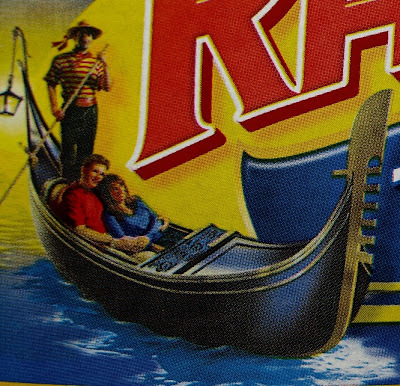 Our Ragú gondolier appears to be wearing a standard issue gondolier's hat - again, with red ribbon. His pants are correct - in fact, much nicer than some I've seen in Venice. Remo and forcola? He's got both, although it looks like the Ragú artist used a broomstick as a model for the remo. 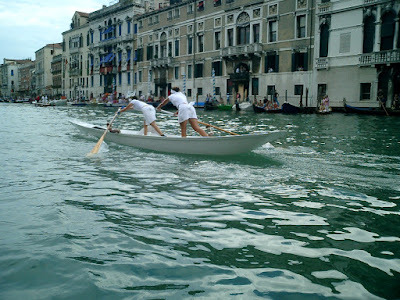 It also looks like the gondolier is poling rather than rowing, and that forcola appears to be half-sized and bent the wrong way. 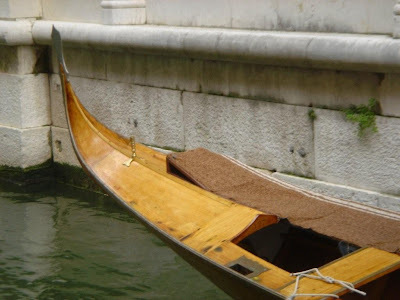 But hey, I'm still impressed that the gondola has a forcola. 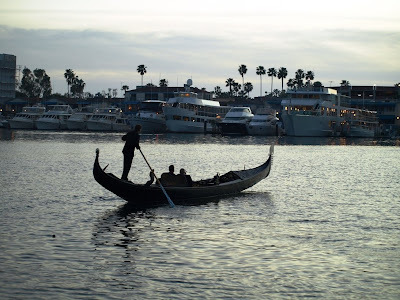 Photos of gondolas in Venice, The Venetian, and a few American operations. It's certainly a better rendering than I've seen in some other places...and the sauce isn't bad either! 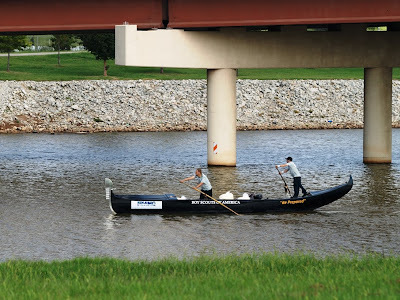 photos by Bob Easton Bob Easton saw my post with the photo of the roof of Il Redentore, and e-mailed me, asking if I'd like some of his photos of the temporary bridge that is built for the feast day celebration. 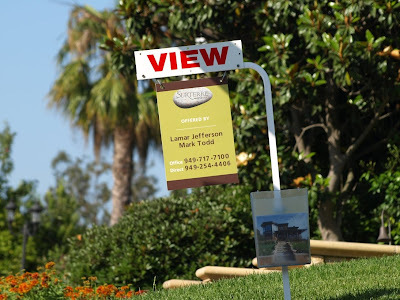 Here's a great shot of the sign, on display to explain the bridge. Click to enlarge - it's worth a read. The temporary bridge covers most of the distance at about sea-level. 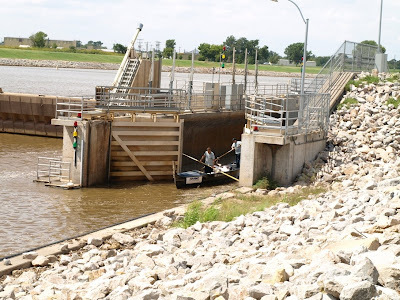 A center section rises up to allow boat traffic to pass under. some day I'd like to cross that bridge myself. Til then, I'm jealous of you! From underneath, the Rialto looks like many other bridges, but if you've ever passed under it, you know - there's something special about it. 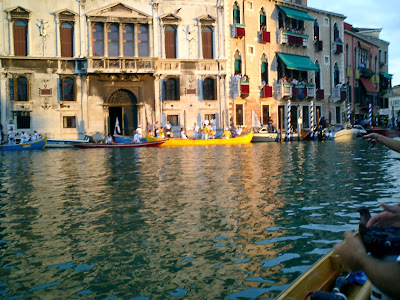 I shot this from the vaporetto one summer afternoon a few years back. 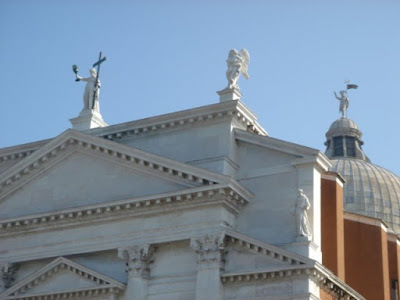 This church was commissioned after the devastating plague of 1576 that swept through Venice and killed a third of the city's population. In 1576 the Doge had vowed to built a church dedicated to Christ the Redeemer (Il Redentore) for bringing an end to the plague. 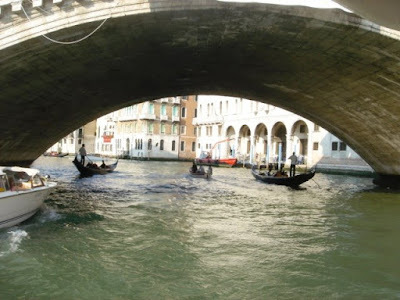 Here's a photo, taken a few years back, at Squero Canaletto in Venice. 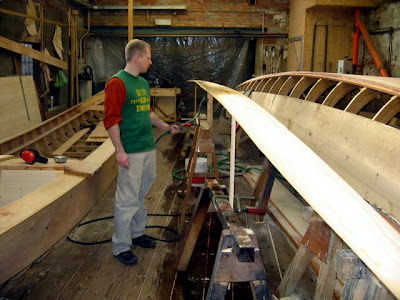 Sean Antonioli was entrusted with many tasks, and he learned a lot about Venetian boat building. Here, he was caught in the act of "bending wood with fire" - one of the coolest parts of the craft. Traditionally, swamp-cane is used as it produces an almost moist smoke, but in a pinch, a propane torch will also work. He's been working in NYC for a company that builds things for display windows in department stores. I was doing carpentry work for them. It's funny...you make big things small and small things big. I made a 3 and a half foot high jack in the box. Hey Sean, I'll be in Manhattan in December - I'll try to find that giant jack-in-the-box and get a photo. 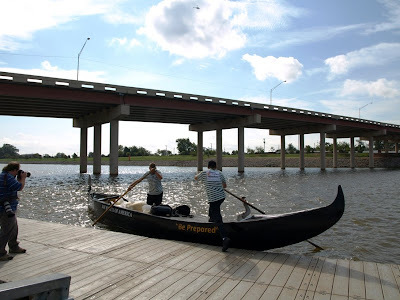 In the days leading up to the expedition in Oklahoma City, the sky every day was a mixture of cloudy and rain. Honestly, clear sunny skies were the last thing we expected. Here are a few images taken on the morning of September 12th in OKC. 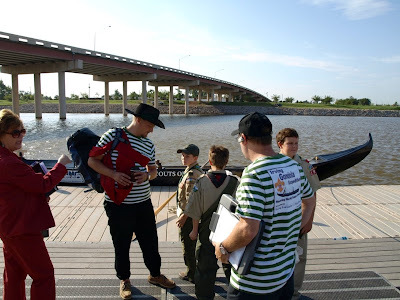 next we had the scouts help cast us off. Finally, we pushed off the dock. and Elisa caught us just as I was pushing off the dock with one foot. This weekend, Collinsville, Illinois holds their annual Italian Fest. 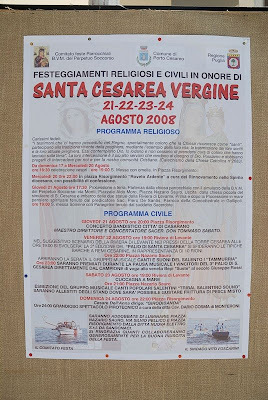 2008 marks the 25th anniversary of the event. There's a fair amount of attention paid towardds Italian heritage in the Midwest. Consider this link on the subject. 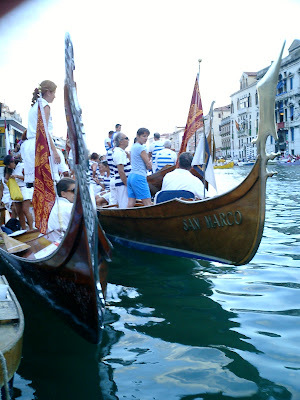 Ina Mierig is back home now in Hamburg, Germany - after a brief but exciting visit to Venice, where she witnessed the Regata Storica. 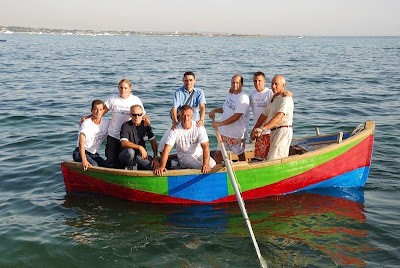 "we went there with a Sanpierota, with the owner and his wife, both don't row very often. And we had the company's photographer and Mathias. 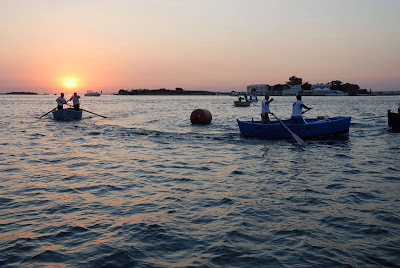 After I rowed the whole bunch to the best place, where they do the big party, we all squeezed ourselves and the boat alongside a Gondola and then we started to drink Prosecco and eat meatballs." 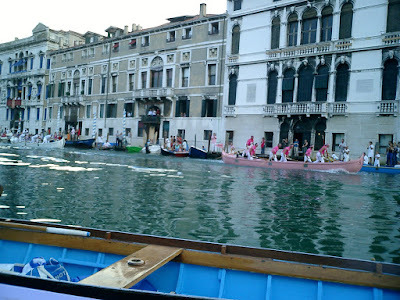 The view across the Grand Canal from the Sanpierota. 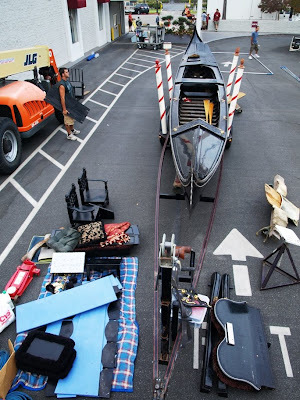 some of the interesting boats with rowers and spectators. Along with thousands of others, Ina and her friends watched as the boats went by. "It was really amazing, how good they are and how fast. 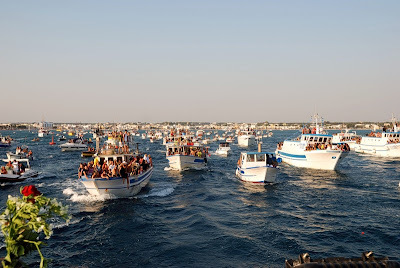 We saw a lot of crashes and I assume they do it to give few boat-builders a good job. 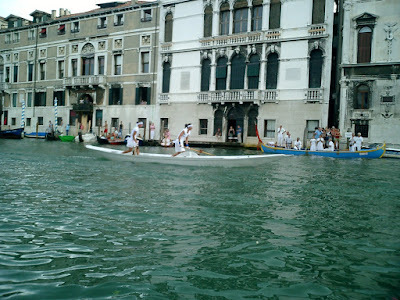 After the gondolini, which are the last race, we went for a party in a Garden overlooking the Canal Grande and so the day was perfect." Rowers celebrate and recover after the caorlina race. "I hope you're all in good shape. 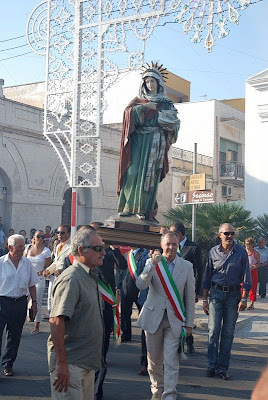 Maybe we'll see you at the Vogalonga, I booked flights today." Thanks for the report Ina. 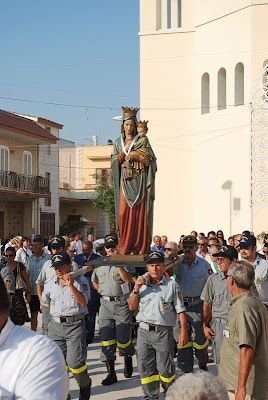 We hope to see you at Vogalonga. 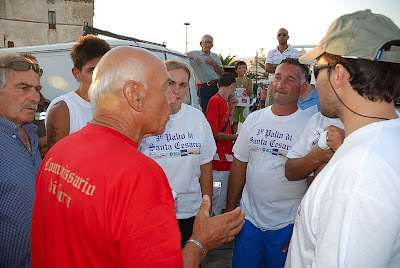 Nereo Zane's blog has some great photos, taken on September 11th, of Vittorio Orio. 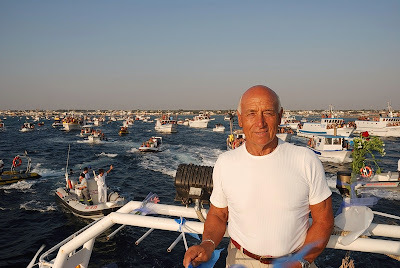 Not surprisingly, Vittorio maintains his reverence to the fallen heroes of 9-11 and dressed his gondola accordingly, rowing once again in tribute. Eveything went well, and we're quite happy. Just a few photos to tie you over until I get some sleep!